Mayor Peduto launched a pothole repair blitz this week to attempt to try to patch most of the holes that have been wreaking havoc on city roads. Phone – Call 311 from any phone from the city of Pittsburgh. If you are outside of the city – call 412-255-2621. Text – send a text message to 412-573-9736. Allegheny County is located in PennDot District 11. Use this form to report potholes in PennDot District 11. Contact information compiled by the Post-Gazette from the January 11, 2014 article on potholes. 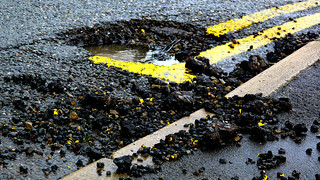 The City of Moline, Illinois is hosting a “Pothole-of-the-Month” contest. The citizen who reports the biggest biggest pothole for the month to the department of Public Works will win a $50 gift card. Contest details are available on the Moline Public Works website here.